At the law firm of Pollock Cohen LLP in New York, New York, we pride ourselves on providing first-class legal representation to individuals and businesses dealing with a wide array of serious and complex legal challenges. Our clients come from the greater New York City area, across the nation, and throughout the world. Our primary focus is in whistleblower representation, with many cases arising under the False Claims Act, other whistleblower laws, and often emerging out of retaliation against employees. Proudly, we have become one of the top small practices in the region with this special expertise. Other areas of experience and expertise for which clients often turn to us include complex commercial disputes, LLC and partnership conflicts, and judgment enforcement matters. We also handle defamation actions and employment-related grievances such as discrimination, harassment, and wrongful termination. Plus we often work with other firms on medical malpractice, personal injury, and product liability cases. We understand you have a lot of options when it comes to legal representation. 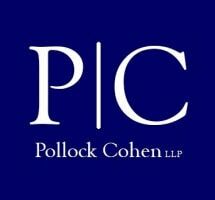 We think we set ourselves apart from many other law firms in the area in three ways. First, we are completely focused on solving your problem and getting results. Sometimes that means going into court. But very often it means avoiding litigation and securing your desired result through other tools and strategies. We provide creative – and often counter-intuitive – thinking to help solve your problem. Second, we listen to our clients, and we respond quickly. We know how infuriating it can be when professionals of any sort don’t really hear what clients are saying, or when firms are slow to respond. And third, we are not fans of the hourly-billing model. Instead, our job is to help you to efficiently achieve the positive results you seek and to deliver creative fee arrangements to that end. To find out more about how Pollock Cohen LLP can best help you address your issues and move forward with confidence, please contact our law office to schedule a free and confidential initial consultation.